Set in the heart of Milan, this elegant and stylish hotel is surrounded by art and fashion. 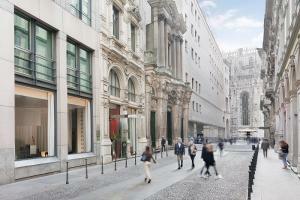 The hotel is just a stone's throw from the Cathedral and the La Scala Opera House. Enjoy the elegant outdoor terrace for enchanting breakfasts, lunches and candlelit dinners. Each of the 21 rooms features unique design, minimalist furniture and a wealth of amenities. Located about 9 miles from the Milano Linate airport and about 27 miles from Milano Malpensa.